While 2018 was full of stress in regards to the world of love, 2019 is going to be much more willing to forgive. As February 8th makes it’s way here lots of things will be changing and you need to be aware of those changes. Right now the Sun is in the constellation Aquarius, that means that each of us are being offered chances to really move forward and help others as well as facing things in a more independent manner. On February 8th the Sun (in Aquarius) went sextile Jupiter and when it comes to relationships and love that is something that will be grants far more wishes than you or anyone else could imagine. The energies may not be as overwhelming as most would expect them to be but they will be affecting us for months to come and allow us to truly experience the people before us on a deeper level. Now, for those who may not be aware, a sextile is something that occurs when two planets are within about 60 degrees of each other. This enhances their energies and allows them to influence one another and all of us. The celestial bodies control far more in our lives than we tend to comprehend and even the smallest things can be stemming from places you might never have imagined. A sextile in itself will, for the most part, bring forth lots of courage and if the energies it brings are used properly can present us with benefits we should all be reaping. 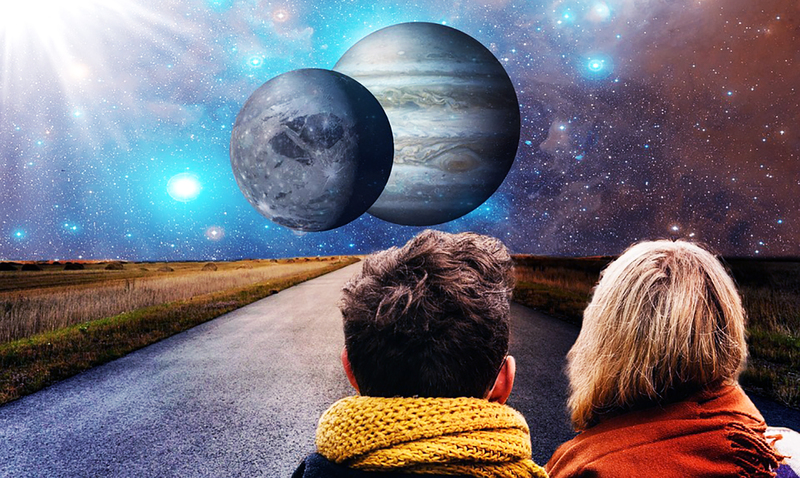 The Sun sextile Jupiter transit of February 2019 will be one that allows us to invite more optimism into our lives. We will all be facing a turn of luck and be much happier within reason. Whether you are someone who believes that everything happens for a reason or not this transit will be working in your favor. During this time you should work hard and do all you can to make sure you reach the goals you have set for this year. This ‘turning point’ in itself is something that can help you grow both spiritually and materially if you will allow it to, that is. The celestial body Jupiter is often referred to as the King of the Gods and is the planet of ‘plenty.’ This planet seeks knowledge and when under its influence, even on a minuscule level can broaden our reach dramatically. Jupiter is associated strongly with good luck, bounty, and growth. These, as you have most likely already grasped, are things we can all use in our day to day lives. While not necessarily the most interesting planet Jupiter packs a punch of positivity that no one should ignore. The effects gained from this celestial event will most likely last until about October and depending on your sign might really turn your world upside down in a fantastic way. This will be an experience like no other and allow you to truly define who you are and who you want to be. You might find that the person you are with is not the person you want to be with and be able to finally move forward or you might go back into your past and gain the closure you’ve been lacking for so long. Questioning things is unavoidable but during this time you will at the very least be able to once and for all gain real answers. While this sextile will hold different things for each sign as noted above it will remind us that we have to work hard to be together and set the mood for everything to end up playing out as it should. You will be able to keep the bigger picture in mind and align more properly with the way the Universe wants you to move forward and that in itself is magical. From now until October doors that you never thought would open will be opening for you. Your heart will be more willing to love and your mind more willing to expand. People you haven’t gotten to know will begin opening up and those closest to you will let down their guard. Everything will feel much more personal and in that nourishment and flourishing emotions will come. Reconnecting with your deeper self during this time is crucial and will bring forth a feeling you might not necessarily be used to. You should find that you are able to keep focused on your aims and ambitions, and linking these with your innate optimism and self-confidence should ensure success. You may be especially attracted towards opportunities associated with the media and communication, or in the generation of ideas for schemes and projects which improve the quality of life in society. You feel the need to develop a suitable personal lifestyle in which there are opportunities for freedom, growth, and creative development, enabling you to diminish those less enjoyable aspects of life, consciously replacing them by activities that evoke your strengths and talents. Seeking wealth may not engage your wholehearted participation, but the abundance and prosperity of a suitable lifestyle will attract your creative endeavors. Our hearts are going to be letting us know when they feel something in the months to come and the more we work with those feelings the better. This romantic boost might really be the spark many of us have been looking for. As the days pass I am sure you will feel these energies more and more. To hear more about what could be holding influence over you in the months to come check out the video below, there is a lot going on in the world of the celestial bodies and the more you know the better.